Across Brussels, British residents are waking up. The first thing midwife Jo Everatt does is to check websites for Brexit updates. Lobbyist Brian O'Riordan scans two newspapers. European Union official Chris Kendall checks Twitter. For Brits living and working in the heart of the European Union, the Brexit debate and the uncertainty surrounding it is a constant background noise that occasionally fades away — then comes roaring back louder than ever. While British lawmakers bicker over the terms of their country's divorce from the EU, British citizens in Brussels — where the bloc's headquarters is located — worry about Brexit's impact on their ability to work and travel, on their savings and on their plans for their future. Many, after holding out for years, are applying for a second citizenship in their adopted country. "It can become obsessive if you let it," O'Riordan said in the dining room of his home just outside Brussels. "So yeah, it's trying to get the balance right between living your life normally and not being obsessed with Brexit." That's tough when their very futures are so tightly interwoven with the fate of Britain's faltering plan to leave the EU. The Brexit noise has been at full volume this week as lawmakers in the British Parliament voted overwhelmingly to reject a deal worked out between their government and the European Union, then voted also against leaving the bloc without a deal. On Thursday, British politicians voted to postpone it altogether. Nowhere are the moves being followed so closely as here in Brussels, which lives and breathes European politics. These days, as the clock runs down toward Britain's promise to leave on March 29, politics means Brexit. In the shadow of the X-shaped Berlaymont building that houses the European Commission, office workers drink coffee and leaf through newspapers in a cacophony of languages — all with front pages dominated by the latest Brexit machinations in London. Across the street, a row of the EU's blue flags with 12 gold stars snap in a stiff early spring breeze. The proposed deal would protect the rights of Britons in Europe — and vice-versa — but with its survival in question Britons on the continent are in limbo. "It's a kind of bizarre feeling, this sense of disempowerment, helplessness watching it all happen, not really understanding why," O'Riordan said. That uncertainty finally pushed him over the edge. 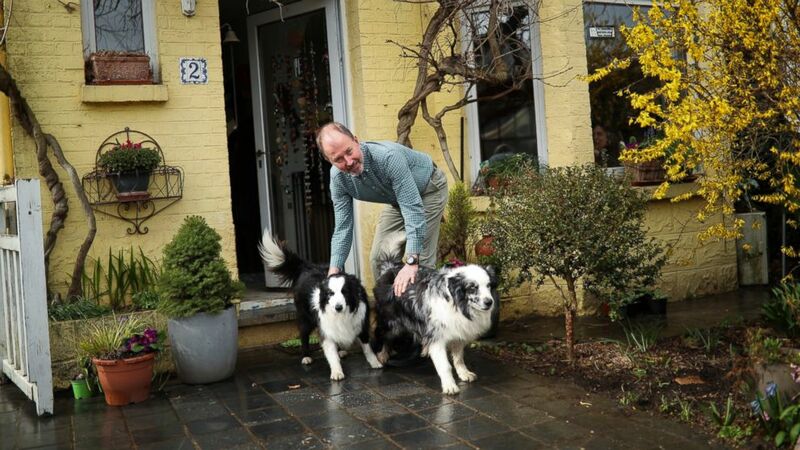 He has lived in Belgium for two decades and speaks French to his two border collie dogs — all the while being happy to be British. But with Brexit looming, he shifted his pension savings out of Britain and took Belgian citizenship. The Belgian government's statistics service, StatBel, released figures this week showing a spike in Brits becoming Belgians after the 2016 Brexit referendum. In 2015, 127 Britons took Belgian citizenship. The following year the number soared to 506. In 2017, 1,375 of the 23,000 Brits living in Belgium — a whopping 6 percent — adopted Belgian nationality. Everatt, the midwife, hasn't made the switch, but she contemplates it as she frets about her future: How will Brexit affect her regular trips to England? What will it mean for her thriving Belgian business running classes for young expat mothers in a first-floor room overlooking the gravel paths and manicured lawns of Ambiorix Square? She has seen young mothers moving back to the U.K. and others worried at the prospect of having to relocate. "The thought of them leaving and going home is sad because you leave a chapter of your life behind and it's enforced," she said. "It's not a voluntary move. It's 'turn the lights out and leave everything behind.'" Some Brits find the only way to escape the Brexit blues is with humor. Chris Kendall, a British-German EU official who works in the bloc's foreign service, tweets and podcasts his thoughts to thousands of followers. "It's a golden age for gallows humor," he said at a cafe next to the European Commission's office block. "And there's so much to laugh at, so it is definitely a coping mechanism." Kendall works in Brussels during the week and heads back to England over the weekends to be with his partner and their four children. As he holds both British and German passports, his freedom of movement is guaranteed even after Brexit. But he fears his regular trips to and from home will be affected by holdups at the border regardless. "When I'm heading home, I want to get home as soon as I possibly can," he said. "You know a big part of the EU and having this ability to work across borders and travel freely is wonderful. So any disruption to that is going to materially affect my quality of life."